Renovascular Hypertension is also called 'Renal Hypertension'. It is a condition in which High blood pressure (greater than 130/80 mmHg) caused by narrowing of the arteries that carry blood to the kidneys. Narrowing or blockage of the arteries that supply blood to the kidneys is called 'Renal artery stenosis. Renovascular hypertension (RVH) is the form of secondary hypertension. In this some people have hypertension due to sleep apnea, obesity, thyroid problem. Renin Angiotensin system (RAS) or Renin–Angiotensin Aldosterone system (RAAS) is a hormone system that is involved in the regulation of the arterial blood pressure. When the renal blood flow reduced, then kidneys convert Prorenin (protein) into Renin. 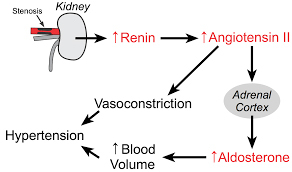 Renin breaks into small plasma protein known as Angiotensin II Angiotensin II stimulates the secretion of the hormone aldosterone from the adrenal cortex. If the RAAS is excessively active, blood volume increases resulting blood pressure becomes too high. There are many drugs that interrupt different steps in this system to lower blood pressure. WHAT ARE THE CAUSES OF RENAL HYPERTENSION? 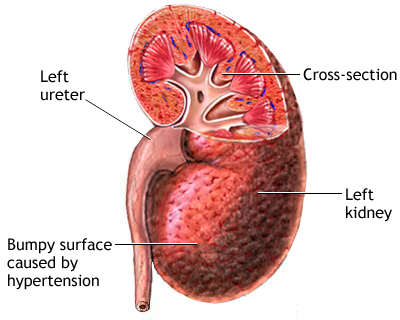 When the arteries which carry blood to your kidneys becomes narrow, less blood flows to the kidneys. It releases hormones that tell the body to hold on to more salt and water. This causes your blood pressure to rise. 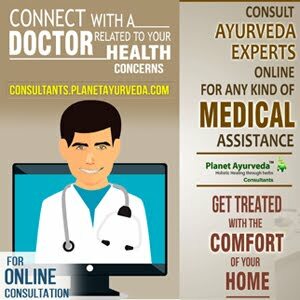 In Ayurveda, there are large number of medicines which help in the treatment of known cause of kidney failure. There are some herbs which are helpful to manage Renovascular Hypertension. Sarpagandha (Rauwolfia serpentine) or black snakeroot: This herb is said to be most powerful hypotensive plant. It is one of the very important Ayurvedic herbs. It is used in treating high BP, lack of sleep (insomnia) etc. DOSE: 2 tab, twice daily with plain water after meals. It is a combination of Arjuna (Terminalia Arjuna), Ashwagandha (Withania somnifera), Brahmi (Bacopa monnieri) and Shankhpushpi (Convolvulus pluricaulis). It contains a combination of standardized extracts of these herbs. All these herbs help to maintain the heart muscles and support the nervous control. DOSE: 1 cap, twice daily with plain water after meals. Arjuna (Terminalia Arjuna) extract has been used in this Ayurvedic medicine. The bark of the tree is used for treating renovascular Diseases. It has other therapeutic benefits including treating asthma, hypertension and kidney stones. The bark is rich in Co-enzyme Q-10, which reduces blood pressure. 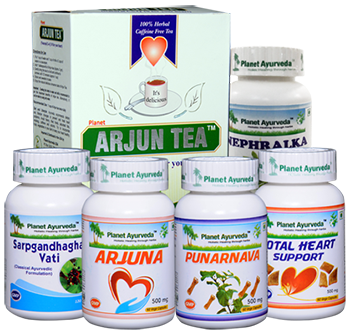 Arjuna tea is another herbal product containing Arjuna bark powder and other herbs. It is delicious in taste. People can use it many times and take regularly. It is one of the bestselling and classical products from the house of Planet Ayurveda. Arjuna Tea is the combination of purely herbal ingredients. It is the most effective treatment for blood pressure and heart problems. Arjuna tea is an herbal tea formulation, like; Terminalia Arjuna, Cinnamon, Cardamom, Boerhavia diffusa, Ficus religiosa. DOSE: 1-2 cups daily, anytime. Punarnava (Boerhavia diffusa / Hogweed), which literally means 'bring back to life' or 're-newer'. It is having multiple benefits to cure disease. Its leaves are used as vegetable. It helps to remove excess of water from the body in case of kidney failure. The herb is regarded as the natural cleanser that helps to remove toxins from the kidney. DOSE: 2 cap, twice daily with plain water after meals. Planet Ayurveda offer Nephralka capsules for all kinds of renal problems. The capsules are made using only pure extracts of five herbs..
A person who suffering from Renovascular Hypertension can take this medicine. Do Pranayama at least for 2-3 minutes in a day. Quit smoking and alcohol intake. Undergo Abhyanga – oil massage at least once a week. It reduces Stress and tensions. If you are into excess of non-vegetarian food, consider going fully vegetarian. It is scientifically proven that vegetarian diet reduces high blood pressure. Have more of – Vegetables, fruits, whole grains and low-fat dairy foods, less intake of meat, fish, poultry, nuts and beans. Celery, carrot, garlic, flaxseed, flaxseed oil, tulsi tea, green tea, cardamom tea, tender coconut water, drumstick (moringa), olive oil… all are good to have.